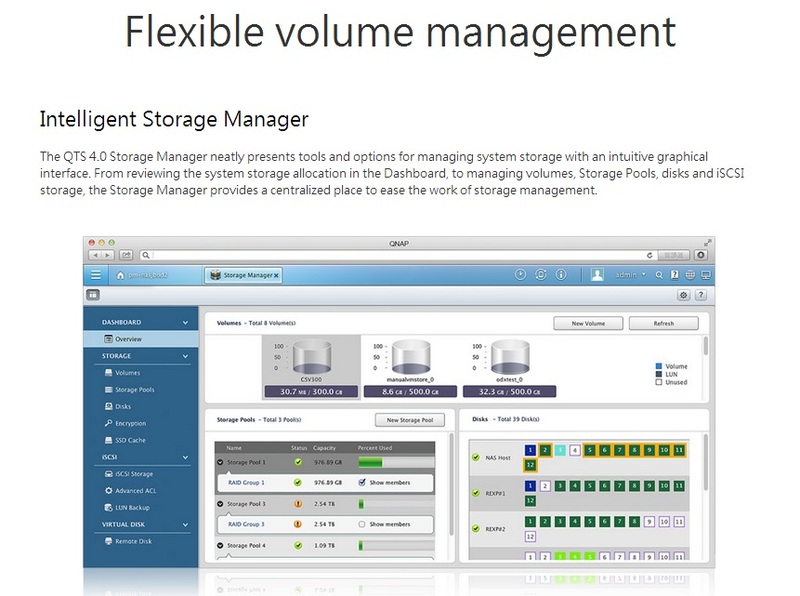 You can use QNAP flexible volume management to better manage your storage capacity. The storage pool aggregates hard drives into a bigger storage space, and with the ability to support multiple RAID groups, the storage pool can offer more redundant protection and reduce risk of data crash. With thin provisioning, storage space can be used more efficiently, and users can dynamically add or expand the capacity on demand to deploy storage for intended applications. 1. 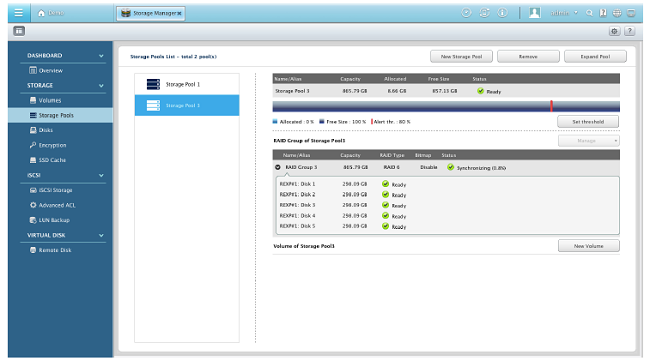 Go to Storage Manager > Storage Pool, and click New Storage Pool to open the storage creation window. 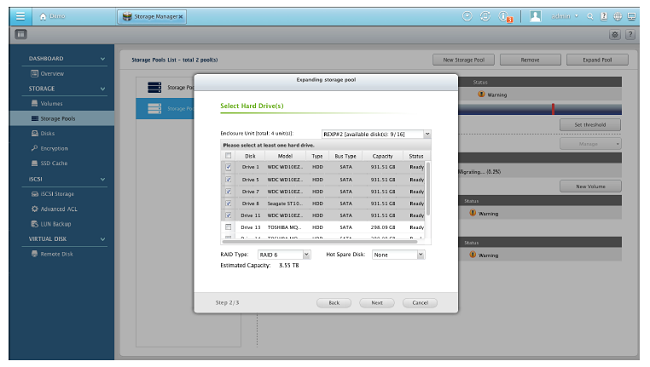 Select the enclosure and hard drives to add to the new storage pool and select a proper RAID type. 2. Click Create, and a new storage pool will be created. Note that the data on selected hard drives will be cleared. 1. 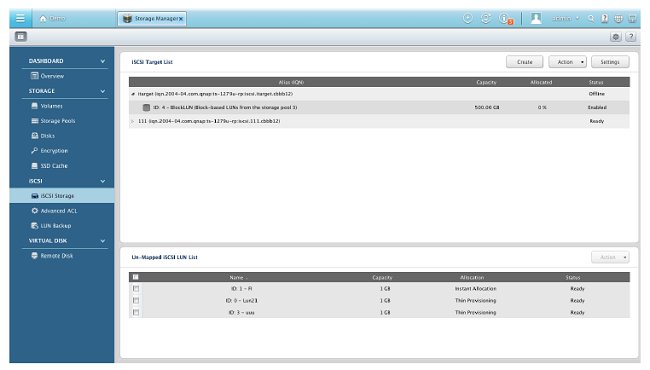 Go to Storage Manager > Storage Pool, click Expand Pool to bring up the Storage Pool Expansion WIzard. 2. 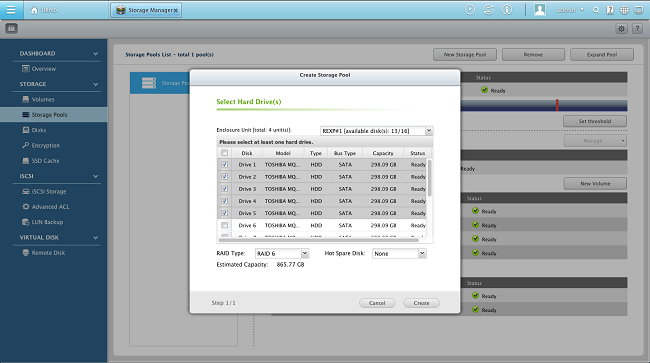 Select adding new hard drives to an existing RAID group and click Next. 3. Select an enclosure and hard drive to be added to the RAID group and click Next. 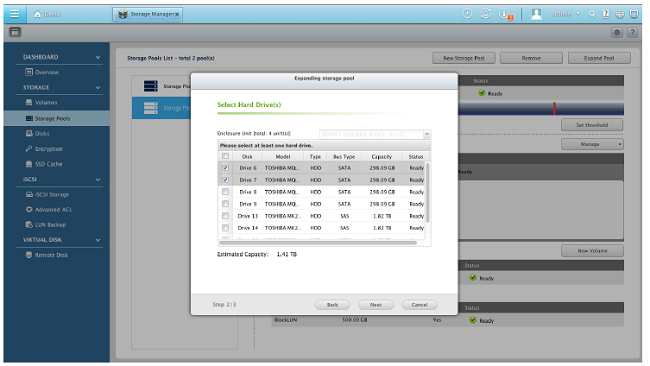 Note that only hard drives in the same enclosure can be added to the RAID group. 4. Preview settings in the summary page and click Expand to finish. Note that data on the selected hard drives will be cleared. 1. 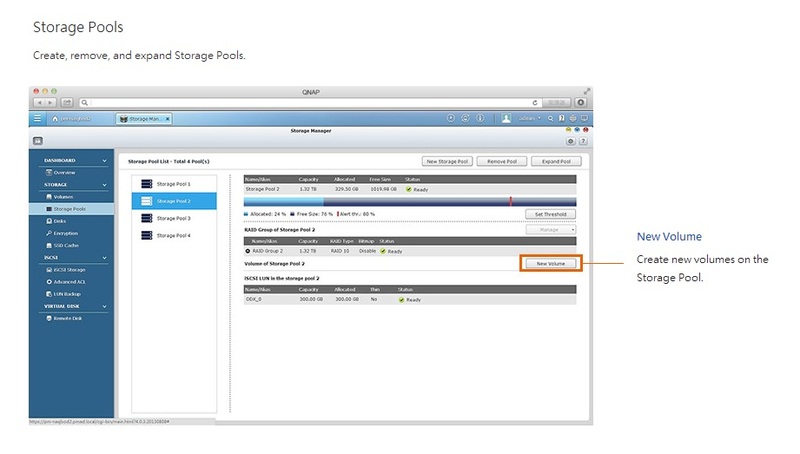 Go to Storage Manager > Storage Pool and click Expand Pool to bring up the Storage Pool Expansion Wizard. 2. Select Create a new RAID group and click Next. 3. 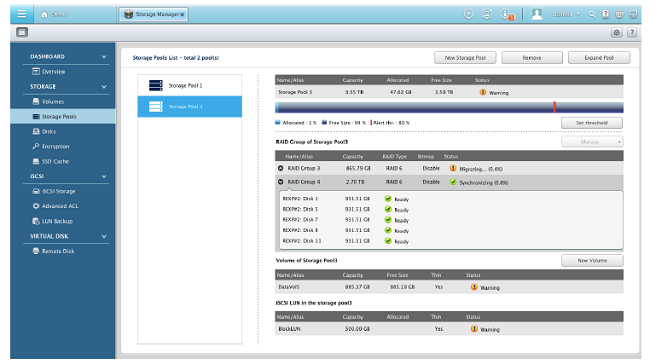 Select an enclosure and hard drives to be added to the RAID group and click Next. 4. Preview settings in the confirmation page and click Expand to finish. 1. 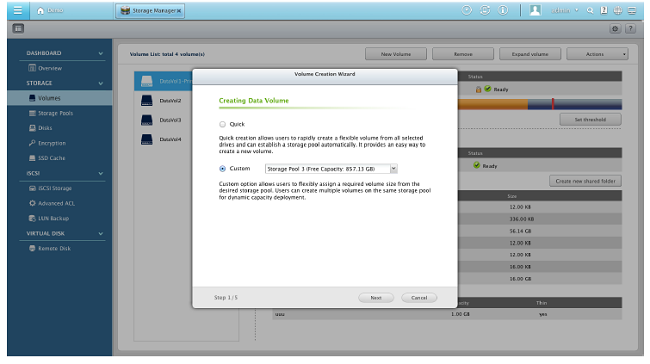 Go to Storage Manager > Volume and click New Volume to bring up the Volume Creation Wizard. 2. Select Quick or Custom. 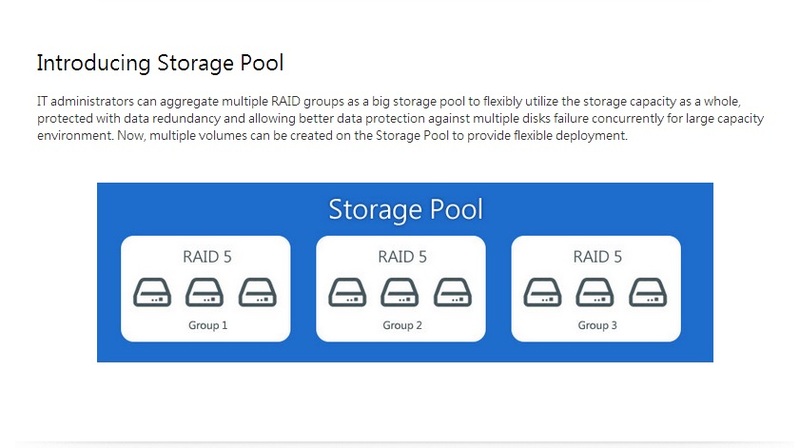 In this example, we hope to use the newly created storage pool. So, select Custom and the name of the storage pool and click Next. 3. 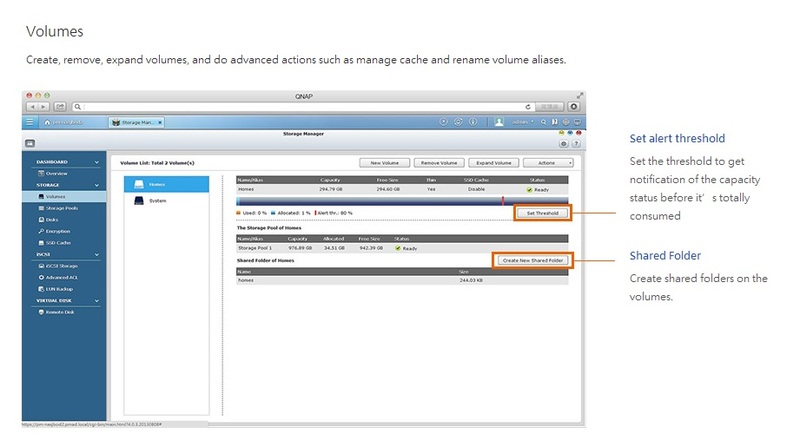 Specify the volume capacity and the rest of the options and click Next. 4. Review all settings in the confirmation page and click Next. 5. A new volume is created. 1. Go to Storage Manager > Volume and click Expand volume to bring up the Volume Resizing Wizard. 2. 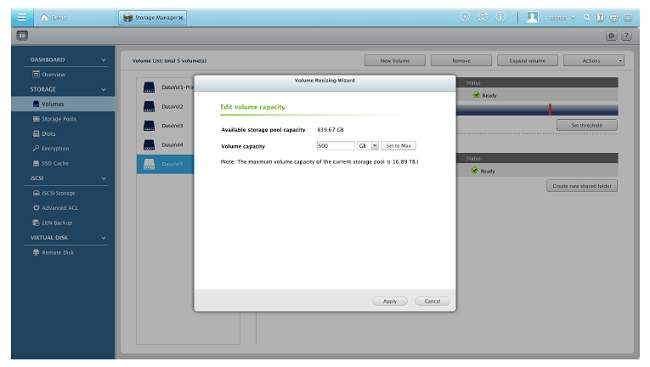 Specify the size of the new capacity. 3. Click Apply to expand the volume capacity. 1. 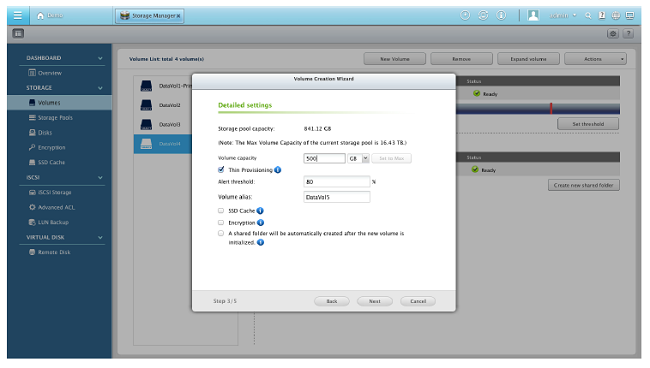 Go to Storage Manager > iSCSI Storage and click Create to bring up the iSCSI Quick Configuration Wizard. 2. 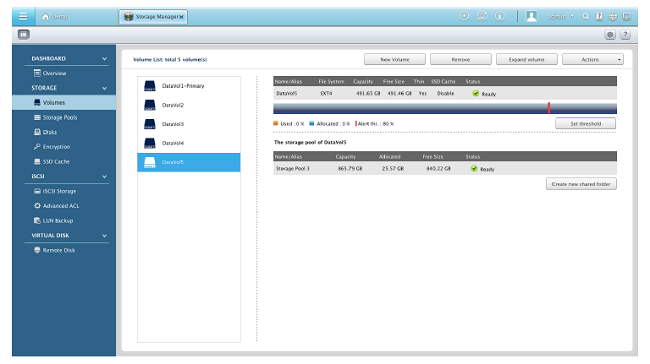 Select iSCSI LUN only and click Next. 3. 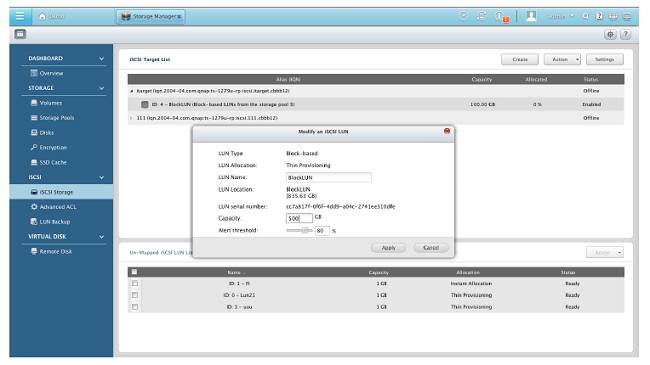 Select Block-­‐based in LUN type, enter a LUN name and select the storage pool. Click Next. 4. Select an iSCSI target to map and click Next. 5. Preview settings in the confirmation page and click Next. 6. 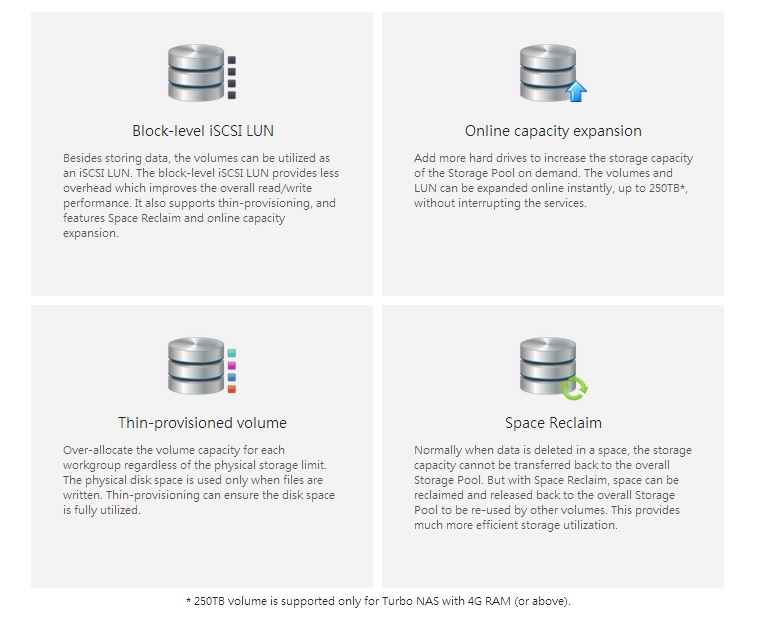 A block-­‐based iSCSI LUN is created. 1. 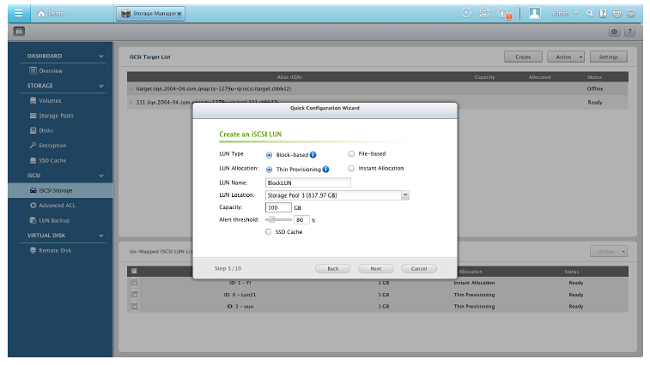 Go to Storage Manager > iSCSI Storage, select an iSCSI LUN and click Action > Modify to open the iSCSI LUN configuration page. 2. 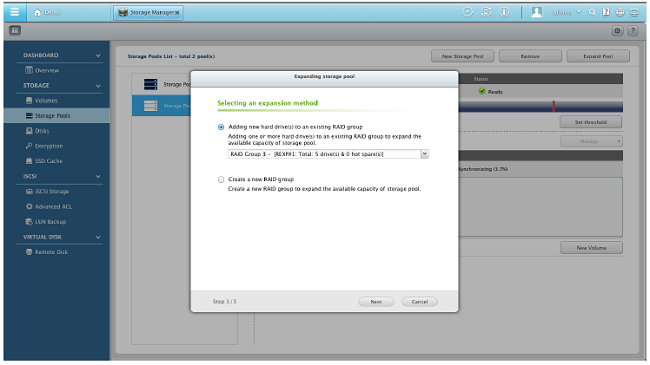 Enter the size of the new capacity and click Apply to finish configuration.